The Tameside Local History Forum have been hosting Heritage Open Days since 2005, working with TMBC to produce a leaflet for Tameside's nine towns. The first leaflet was A5 size and listed 25 venues. It was designed to be opened out to be used as a poster. In 2006 the leaflet listed 24 venues and the centre pages had a map of places of interest with information about the buildings' facilities on the back. The cover featured a building of historical or architectural interest. 2007 followed the same format but the colour was changed. Numbers of venues which opened for HODs in Tameside steadily increased to 34 in 2010. In 2012 the front of the leaflet showed the Court Leet chair which the Forum had purchased at auction. In 2013 the format changed to an A4 sheet folded in half with the venues in town order. The theme for 2016 was water, a life force for the church, industry and leisure. Previous themes have included stained glass as the borough boasts some beautiful examples, but in 2017 the emphasis was on "behind closed doors" and, once again, 32 venues opened and the Forum designed and paid for 2000 leaflets. Some of the most popular buildings are Newton Hall in Hyde, Ashton Parish church, Fairfield Moravian Settlement and Dukinfield Old Chapel to name just a few. We have a meeting in February each year to discuss the next year's events and to encourage new venues to join us. After the North West Regional Research Framework launch conference in May 2017, we have organised a series of workshops designed for you to have a chance to become involved with the project and contribute your knowledge to an individual time period. These workshops are due to start in September and I would like to invite you to express your interest in attending one or more of them. Unfortunately, these workshops are limited to 25 spaces and it will be invite attendance only, so after you express your interest I will contact you to confirm a space has been booked. If you would like to contribute but cannot make it to the workshops, we do have other routes where you can still contribute your knowledge. You can also keep updated with the project on the NWRRF blog site https://archaeologynorthwest.wordpress.com/about/. Please let me know the workshop/s that you would like to attend and contribute towards. I appreciate that this is a very short notice for the September workshops. In collaboration with the Working Class Movement Library present a day exploring the effects of the Russian Revolution on the British Labour and Peace Movements. Our annual Forum social evening took place at Dukinfield Town Hall on the evening of Friday 18th November guests began to arrive 7.30pm onwards. The event was very well attended, as members and friends jostled for seats. Our social event coincidentally was to share an 88th birthday of great supporter and friend to all Mr Harry Lever. Harry had arranged the brass band from St. John`s Droylsden to entertain the group for the evening. MP David Hayes was guest of honour, and an announcement was made to welcome our member of parliament who had agreed to be our President in the coming year. We also had a quiz arranged by Stephen Fisher, the excellent supper was a potato pie which was also very well received. The evening continued with an auction which raised a few coffers to go into our Court Leet Chair fund. Just before close of play the raffle was drawn, thanks and speeches were made and everyone agreed it had been a splendid evening. click here for a slideshow of some of the photos taken on the day. 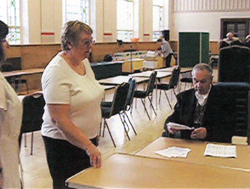 Please click here to read a lovely account of the Lancashire Society's day at our Heritage Fair at Stalybridge in 2009. This EVENT was an unqualified success and here are some photographs to remember the day. 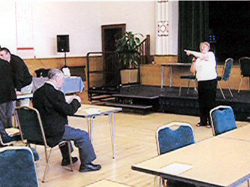 As you can see Dukinfield Town Hall is a prestigious venue and we want to thank the staff for all the help they offered. We were also exceptionally fortunate in getting a hub to the internet and the loan of four laptop computers, so the Family History Demonstrations were 'live' on the day. The catering staff also worked hard on the day, providing drinks and light lunches and snacks. Thank you to Christine for keeping us organised and to everyone who volunteered on the day for making this such a successful event. Christine Clough, MC for the day, and Harry Lever at 8.00am getting the day started. Members of the Forum were invited to a very special event today. 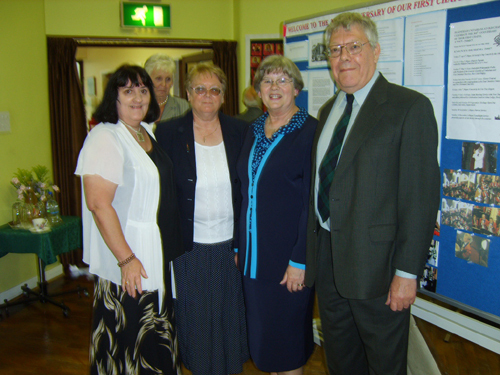 Old Chapel, Dukinfield celebrated their Tercentenary with a special service where H.R.H. 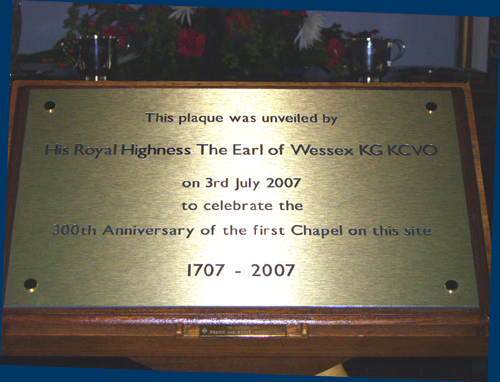 the Earl of Wessex KG KCVO had been invited to unveil a plaque. Dukinfield Unitarians were delighted when they were visited by The Earl Wessex KC KCVO on Tuesday 3 July as part of their celebrations to recognise 300th anniversary of the first dissenting chapel on Chapel Hill, Dukinfield. The Earl with the Lord Lieutenant and the Sheriff of Greater Manchester, and his wife, participated in a service led by the Rev Dr Vernon Marshall during which Janet Ford, Chapel Warden and Chair of Trustees, Dawn Buckle gave two readings outlining the history of the Chapel from 1707 to the present day. Organist, Barry Shaw, a children’s choir from three local primary schools and young people from the Old Chapel Sunday school provided music during the service. The choir sang the hymn ‘Father, lead me day by day’ written by the Rev John Page Hopps who ministered at Dukinfield from 1863-69. The congregation sang lustily, ‘Together now we join as one’ by the Rev Cliff Reed, which outlines the tenets of the Unitarian faith, and ‘There’s a chapel on the hilltop’ written by the late C William Pugh, specifically for the congregation and sung to the tune Blaenwern. 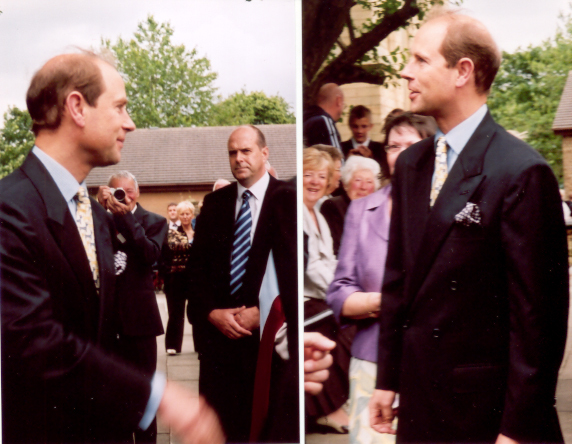 At the close of the service Prince Edward unveiled a plaque commemorating the first chapel on the site. 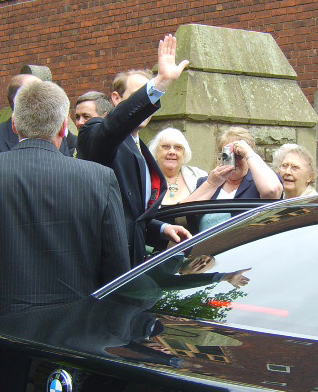 He then spent sometime in the school hall viewing an exhibition of the chapel history, accompanied by Dawn Buckle, and meeting with officers, members and young people of the congregation, and guests who included GA President the Rev Celia Midgley, Vice President Joyce Ashworth, members of the Executive Committee, officers of the East Cheshire Union and North West Provincial Assembly, the Mayor of Tameside and local councillors. The Earl expressed interest in the dissenting tradition, the way the GA was organised and the children’s work in Sunday school. His friendly and attentive manner charmed everyone. After signing the visitors’ book and being presented with two books on Unitarianism written by the present minister and the Minister Emeritus the Rev Dr David Doel, the Earl took his leave. After which, friends and visitors were treated to a sumptuous buffet.